Elijah visited his neurosurgeon and plastic surgeon on Tuesday. If you recall, the last time we saw them was a year ago. 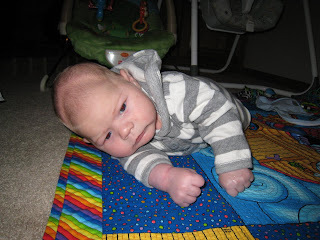 Obviously, a lot has changed in Elijahland since that time (you know…crawling, walking, running, picking things up!). The two docs separately examined his head and both came to the same conclusion: They have no reason to follow Elijah anymore. Elijah is doing well developmentally and his head is still (slowly) growing. If you haven't already figured this out…it's definitely a good thing when a doctor no longer wants to see you! As one of the docs said, "I don't think we need to torture you anymore by having you come here to see us." Yes, Elijah has a small head. Yes, it is still misshapen. No, his skull most likely will never become completely round. No, the bones haven't fused. 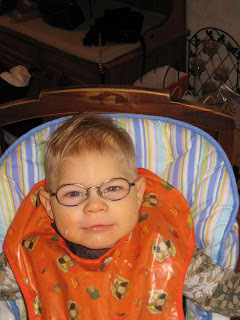 No, Elijah does not have craniosynistosis. Basically, there is nothing that these men can do for us. Their main reason for seeing Elijah was to make sure that his skull didn't fuse prematurely, which wouldn't give his brain a chance to grow. Thankfully, that hasn't happened. There is a surgery they could perform to pull the skeletal bones forward to try to give Elijah's head a rounder appearance. 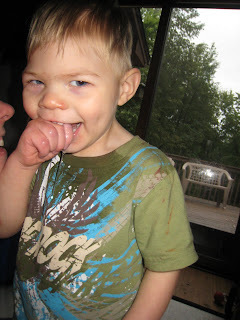 The surgery sounds pretty complicated, the docs wouldn't recommend it, and the neurosurgeon said he didn't think it would change Elijah's appearance much anyway. I could never see Andy and I opting for a surgery that was purely cosmetic, so it's not something we would even consider. So, after being followed by these docs for two years, we no longer have to see them. Two less doctors to see is certainly reason to celebrate! I couldn't bring myself to post a picture from the night Elijah was born. His head was so swollen and misshapen - looking at it made me want to cry. Obviously this is when the head shape issue began, but I just can't bear to look at it. At 1.5 months, his head ridge was pretty prominent. Funny, but at the time I hardly noticed it. I knew it was there, of course, but when I looked at him, I didn't see it. 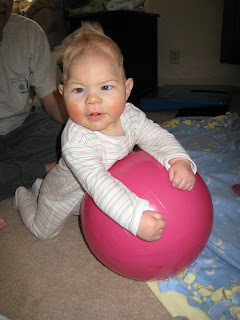 At 8 months, the center of his skull had filled out a bit and had fused. The side sutures remained open and left him with two dents. By 15 months, Elijah's hair was mostly covering up his head shape. The dents seemed less prominent, but it's hard to tell if it's just the hair covering it up. At two, Elijah has a good head of hair which covers up his head shape. I am thankful for this because I'd prefer others to see him (and therefore treat him) as any other two year old... If you look closely, however, you can still see the ridge. Of course, we had hoped that his head would've rounded out by this point. But in the big scheme of things, head shape doesn't seem like that big of a deal. When I look at these pictures, all I see is cute. He is Cute! Darn CUTE!!! LOVE YOU & MISS YOU! Darn right! All I see is cute too! He is a rather handsome dude. Must be in the genes. Elijah, man, glad to hear the good news. You just keep on carrying on.